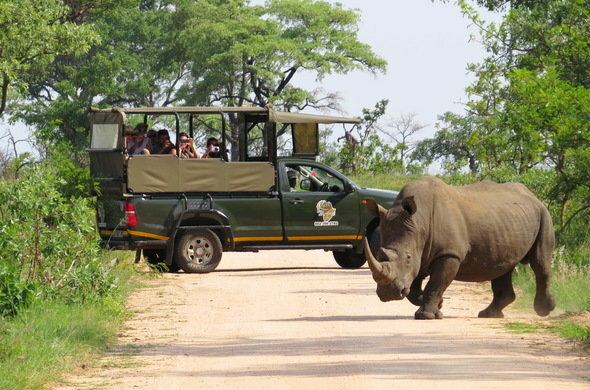 FAIR TRADE Tourism (FTT) has praised Kruger National Park’s “ground-breaking and visionary” 10-year management plan, signed off by Minister Derek Hanekom in his capacity as Acting Minister of Environmental Affairs recently, and has called on the tourism sector to ensure its successful implementation. Game drives such as this in the KNP, continues to help communities living on the periphery of the park to benefit greatly, as per managements 10-year plan. The plan kick-starts the process of expanding Kruger Park’s conservation footprint across international borders, incorporating a wide spectrum of landowners, to create the 10 million-hectare Great Limpopo Transfrontier Conservation Area (GLTFCA) as a world-leading conservation initiative. A wide-ranging array of stakeholders was consulted through 54 public and focus group meetings in the development of the plan. Fair Trade Tourism MD Jane Edge praised the management plan’s focus on the economic inclusion of marginalised communities to ensure the long-term sustainability of the greater Kruger Park. “We urge the tourism sector to rally behind this plan to ensure that the two million people living on the periphery of Kruger Park become constituents for conservation, and not opponents. Game lodges need to create economic linkages with communities through their purchasing decisions, through enterprise and supplier development and by including cultural attractions in their offering. Tour operators should specifically support tourism products that benefit local communities,” she said. FTT says Kruger Park’s history of land dispossession means that many local communities feel alienated, especially as they see little economic benefit from wildlife areas. “There is a common perception that protected areas are the preserve of rich white people for whom wild animals are more important than people. The tourism industry needs to overturn this perception by ensuring that economic empowerment is directly linked to the value of wildlife,” says Edge. 10% contribution of SANParks’ profit from Skukuza Lodge (from year 6). 5% contribution from rhino sales. “Working together, we can help create a breath taking wildlife tourism destination that benefits all stakeholders and serves as an example to the globe,” says Edge.